Day 2: The Dock Master is out of town so Bill is filling in. 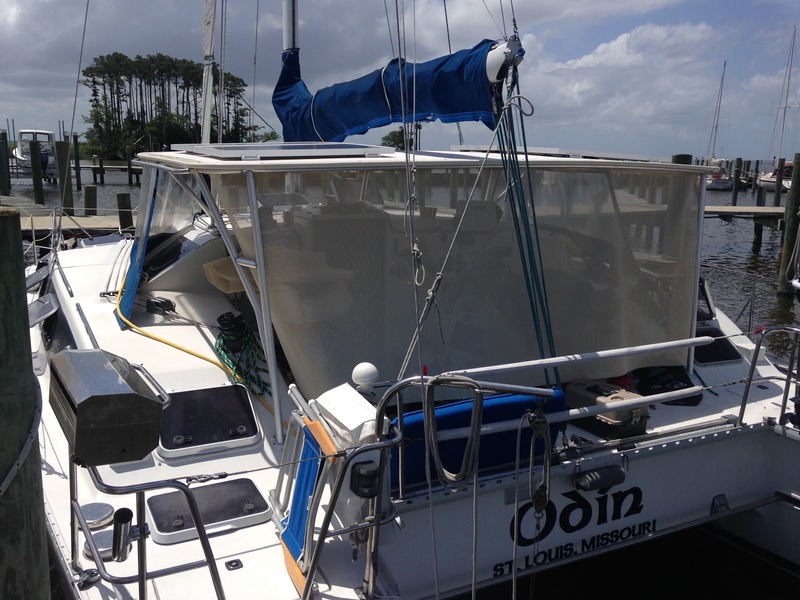 He's a liveaboard (for the last 18 years), that spends the winters in the Bahamas. The next morning, while we are checking in, he gives us lots of advice of the next part of our trip. I spend the holiday Monday watching a few more people run aground right next to us, in the narrow channel. Morning chores for me are showers and laundry. The Captain has already started taking things apart, so we borrow the car for the trip into West Marine and the grocery store. 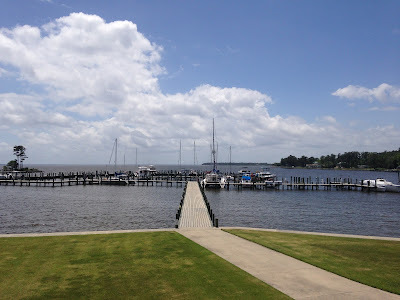 As we pull back into the marina, we see the Nautitech "Misto" from Ocracoke come through the channel and dock at Deatons. Since we are staying a week, they move us off the transient T-head into a regular slip. This puts us closer to the clubhouse, but also situates us so we have the prevailing wind off the river blowing through the hatches and the cockpit. Perfect! 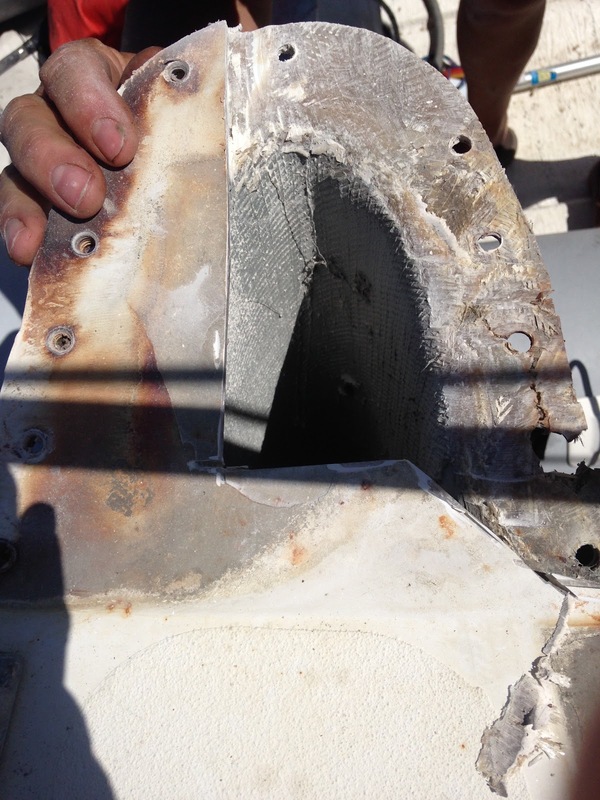 Day 3: The work on the port bow continues. I take care of some paperwork. Another sailboat runs aground. In the time it takes me to defrost the fridge (yep, I've never done that before. I googled it just in case--take food out & put in cooler, turn fridge breaker off, prop door open. Got it. 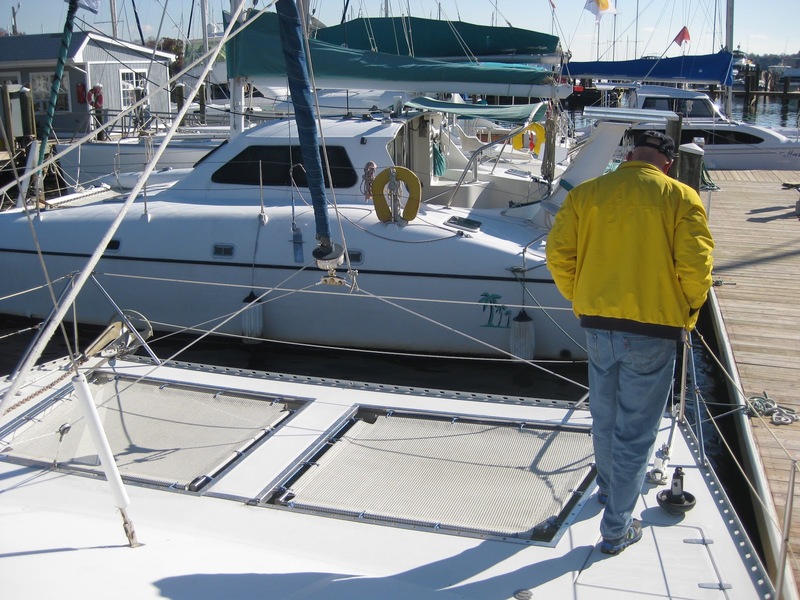 ), the Captain pulls the port engine for routine maintenance. I'm called out because, "You're gonna want a picture of this! Hand me the service manual." Ssshhh! He's reading the manual! In the afternoon heat, we don't have any cold drinks (see above), so we head out for lunch (and a stop at West Marine) and stumble into the Silo. I usually avoid Italian restaurants since I'm a celiac, but I'm surprised to learn they have an EXCELLENT gluten-free pizza crust--and it's buy a second pizza for $3 day! Score! We stop at the hardware store on the way back (sometimes they also have an excellent selection of marine products) and I throw another bottle of bug spray in the pile. "Do we have to buy bug spray at every store we go to?" Yep. 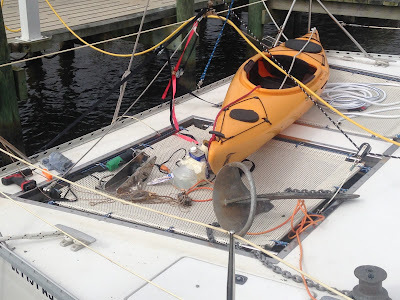 The pile of power tools in the cockpit and on trampoline resulted in another cruiser stopping by to ask for help with his windlass. It's our second 80+ degree day, and the Captain decides to start the a/c. "Yeah, that's not working anymore." Pump quit. Put it on the list. 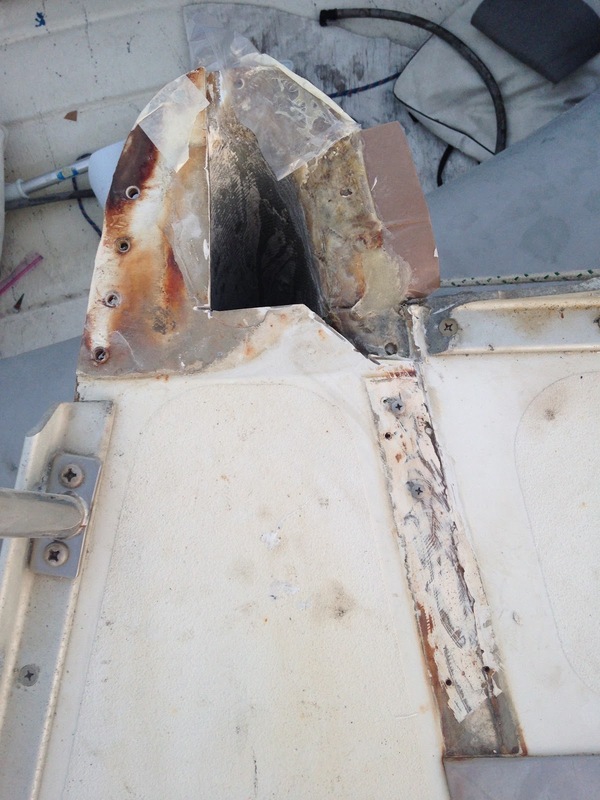 Luckily the afternoon breeze makes it comfortable in the cockpit or under a hatch. Amelia & I took a nap. Day 4: Port bow. Port engine. West Marine. Repeat. 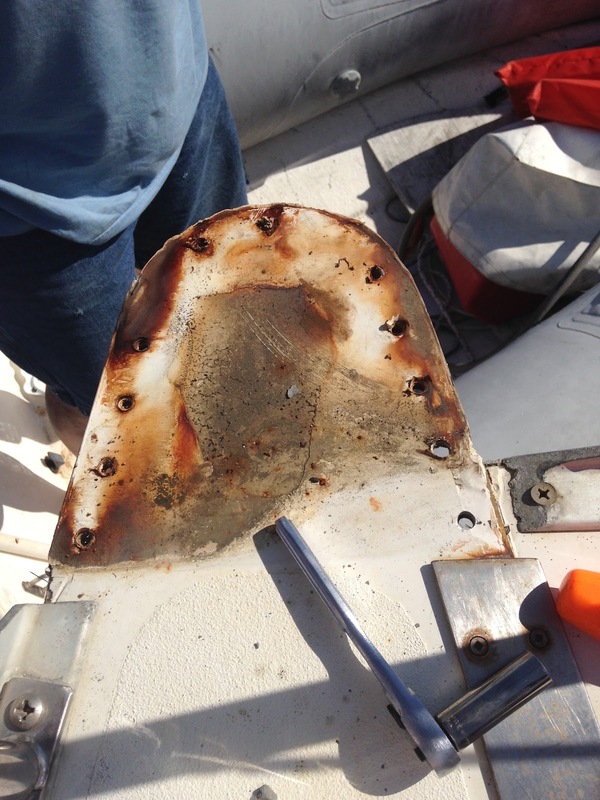 After approximately 20 layers of fiberglass were applied, the port bow repair was completed when the anchor plate (not damaged--good news!) 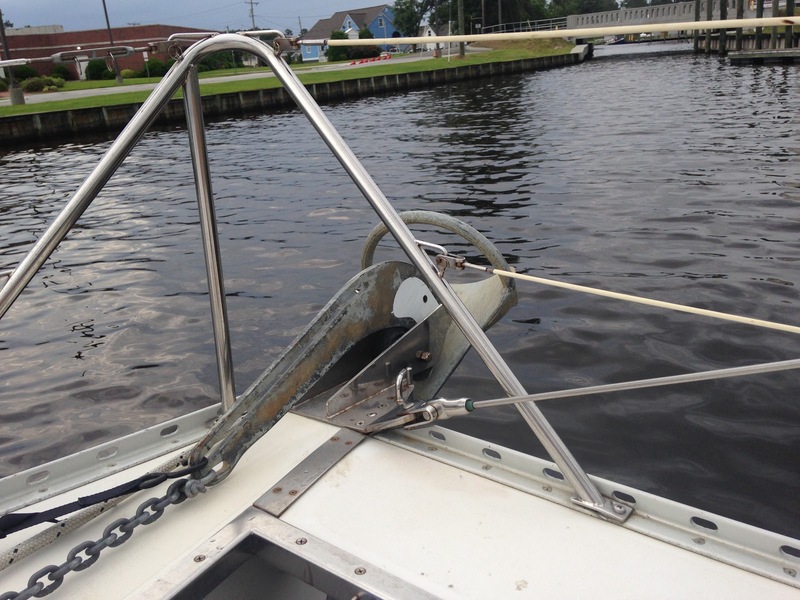 and anchor were reinstalled. (A few more tools went in the water but retrieved with the giant magnet.) This turned out to be the easier project, and went well. The Yamaha engine, however, turned into a debacle that will haunt the Captain for quite awhile. He pulled it to do some lower end preventive maintenance, but the lower end wouldn't come off (apparently quite common on Yamaha's used in salt water). He had 3 choices 1) replace the engine 2) replace the lower end after buying a bigger hammer 3) put it back in the water and wait for engine's natural demise. After banging on it with a hammer all day, he let it sit (actually hang) overnight and decided, after changing the upper and lower oil, to reinstall as is. He's still "thinking about it." A new transient (Ken) stops and asks us if "we are really from St. Louis?" because he's from O'Fallon, MO! No way! He's moving their Catalina 36 (Good Winds) from PA to GA by himself. Wow. 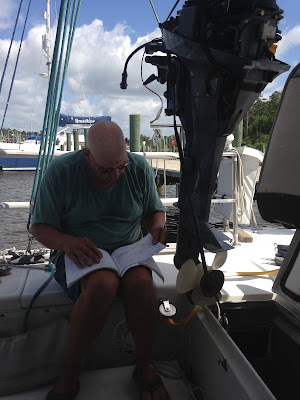 He shares some more routing info (including Cape Lookout), since he is also headed southbound! Bill invited us to join him at Silo's Restaurant for open mike night. What a treat! There is an amazing amount of local talent in this small sailing town. (I even saw the Captain tapping his feet and singing along.) I was in awe. We will be consulting Bill on a regular basis for more bars/musical venues as we head down the coast. Oriental Day 5: I went to breakfast with a fellow female sailor I met through a sailing forum. She introduces me to her friends, we take a walk through town and I got a tour of her Dickinson 41 currently under renovation. Beautiful. She sends me off with an arm load of fresh herbs from her garden. Our forwarded mail shows up. 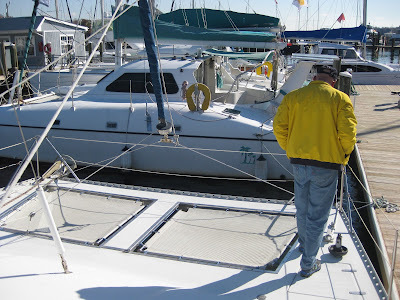 The Captain takes another look at the air conditioning (the main unit is UNDER the anchor chain locker). Yep, it's still broke. And in the process, he discovers the wooden floor of the anchor locker needs to be reinforced. Good times. We go back to West Marine to pick up our order which includes a new offshore life vest for me (we couldn't get a recharge kit for my life vest, so we'll have to order it later) and lots of spare pumps (it turns out everything on a boat is run by a pump). 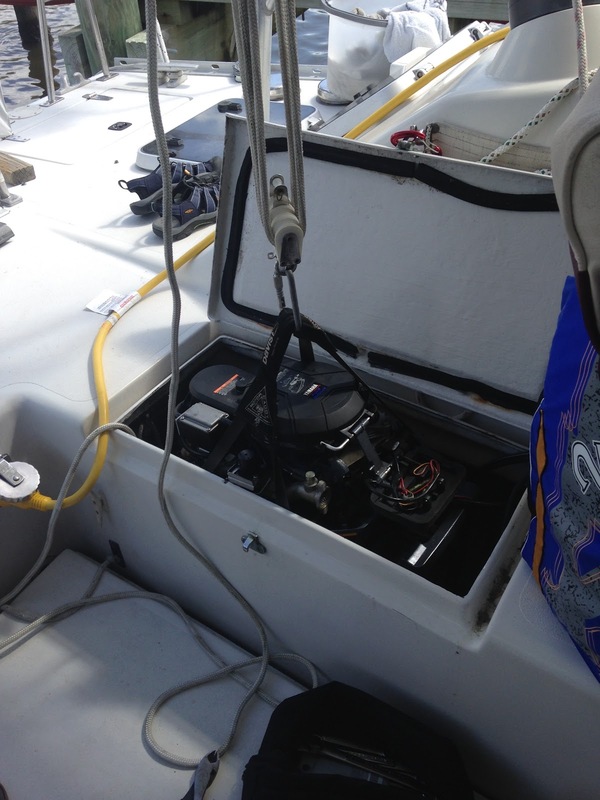 Day 6: The Captain replaces the recently failed deck wash-down pump (makes rinsing off the anchor & chain SO much faster!) 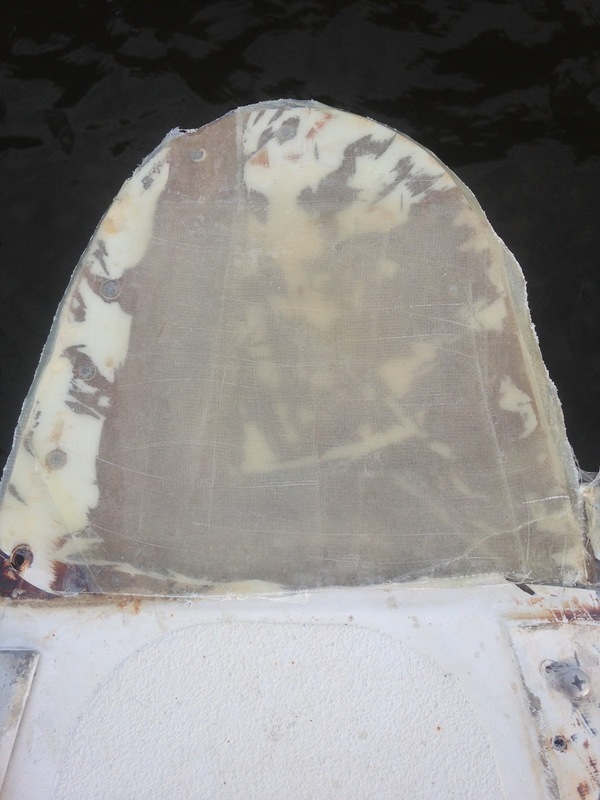 He does a minor fiberglass repair on the aft starboard step. The sim card for our Iridium sat communicator shows up, so I waste a couple hours trying to get that set up. In the evening, we headed back to the Silo's to listen to George Bailey play on the outdoor stage behind the restaurant (The Red Rooster). They had an outdoor bar (with gf cider!) and another gf pizza was ordered. We were greeted at the boat by an unhappy, glaring cat who doesn't like us wandering away in the evenings--apparently. A fully-shaded cockpit and some privacy. Very nice job, Captain! Say hi to Pat at the Provision Co. best place ever! Loving the blog. Best of luck with all the projects. Keep enjoying life! Duane and Diane on m/v Diva Di.